On August 2, 2013, rallies were held in many major cities worldwide to commemorate the International Al-Quds Day. This day is designated by many Muslim communities as a day of remembering Quds (Jerusalem), the entire Palestine, and the catastrophe and calamity that was brought upon them with the creation of the State of Israel. I have mixed feelings about being up here. I'm happy to stand in solidarity with the Palestinian cause on Al Quds day, and sad that it's still necessary to protest their oppression. I would like to start my speech with a biblical verse. In the Bible, Numbers 14-41 after the story with the spies, Moses rebuked the Jewish people, saying "Why are you transgressing the command of the Lord, when that will not succeed? One of our famous commentators, Nachmanides comments on that "rebellion against G-d will never succeed. 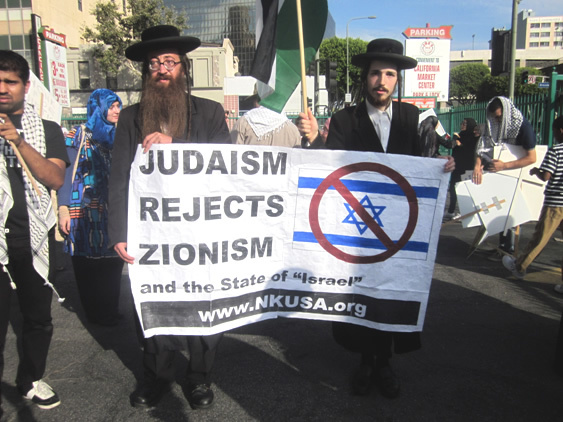 Zionism is a rebellion against G-d! and we've had over sixty years to watch their epic failure. They claimed to want a safe place for the Jews, the most dangerous place for a Jew in the last 60 years was their state. Not to mention stirring up antisemitism all over the world. plenty of people here who can say just exactly what kind of a democracy it better than I can. And they claim to be a Jewish state, when the reality is that they're even less Jewish than they are democratic. And that's a pretty low bar. Some of you may be wondering, if that's the case, why are we here. All we're doing is drilling small holes in the bottom of the Titanic -after it hit the iceberg. The answer is simple. The answer is so that when you look in the mirror, or in later years when you tell your children and grandchildren that there was once a Zionist state, you'll be able to say when there was evil abroad in the world, I had the courage to stand against it, to stand up and be counted, I did my part. G-d doesn't demand success from any individual, all he asks is your best effort. And when enough people of good will stand together we will succeed. I would like to make 3 simple points here today. Judaism is a religion. 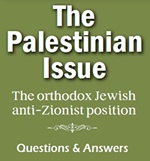 Zionism is heresy, and antithetical to the Jewish religion. For the secular head of an atheist state to claim to represent Judaism, is as absurd, as ridiculous as Joe Stalin claiming to represent all Christianity and Christians, or Bibi Netayahu claiming to represent Islam and all Muslims. Judaism is a religion of peace, Religious Jews would like to live in peace with everyone. We don't need a state. We certainly believe that a state is not something worth killing over and we say Not in our name! God has commanded us to be loyal citizens of the country in which we live. Today, there are loyal American Jewish citizens in the States, loyal English Jewish citizens in England. Please G-d there will soon be loyal Jewish Palestinian citizens, in a free Palestine -min maye lil maye. Apartheid South Africa disintegrated peacefully, Soviet Russia fell apart in a night. Let us pray that this last bastion of evil, the Zionist regime will dissolve, and vanish from the page of time, speedily, peacefully, without costing any more innocent lives.